Led by the incredibly powerful vocals of frontwoman Uliana Preotu, Not The End Of The World, Cilver’s first release since signing on with Entertainment One Music, is not your typical female-fronted rock record. 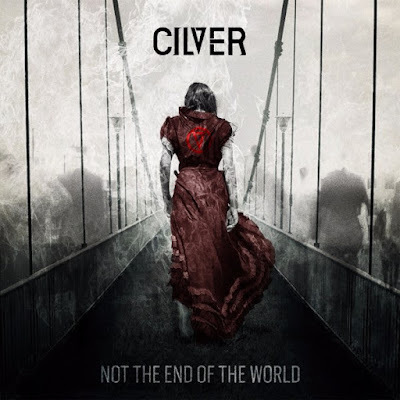 While there are certainly comparisons that could be made (namely Flyleaf and Halestorm), Cilver and Not the End of the World stand on their own legs. This record is equal parts feverish riffs and snarling vocals, with the blazing duel guitar blitz from Leon Lyazidi and Ramsey Modiri laying a proper foundation for Preotu’s impassioned piss-and-vinegar delivery (“Break Free,” “Razorblade,” “It’s My Life”). Colossal standout “Frozen” finds Not The End Of The World at its absolute apex and while Preotu is a very attractive woman, she isn’t ready to be objectified my mainstream media (look no further than “In My Head,” where she defiantly proclaims ‘In my head I feel the pressure from magazines, TV and radio / In my head / They’re in my head’). Female-fronted rock bands have become a dime a dozen as of late, but when you happen one like Cilver and an album like Not the End of the World, you need to stop and smell the roses. Or in this case, listen.